There is something inside us all. Our demons. Great match! This was a huge surprise for me. I haven’t really been into this feud very much and wasn’t looking forward to this match, but Hardy and Orton put on a great, violent show. This had an old-school feel to it. Both men went for weapons almost immediately, and the violence never really stopped. I liked that it wasn’t just a match full of moving furniture to set up elaborate falls. Instead, Orton and Hardy just wanted to hurt each other as quickly and as painfully as possible. There was only one moment where Hardy took time to set something up with multiple items, and it got changed along the way which worked beautifully. There was also a fair amount of blood and some moments that were rather difficult to watch. This match really stood out as being different than many things we’ve seen over the past few years. It had moments where it reminded me of the no holds barred match between Foley and Orton, and the street fight between Foley and Triple H at the Royal Rumble. I’d watch this again for sure. Kayla Braxton welcomes AJ Styles. Styles can’t wait to fight Samoa Joe. He’s going to rip Joe’s heart out. The feud between Becky Lynch and Charlotte. Great match! There was one moment that felt slightly awkward early in the match, but after that I liked everything about this. Becky had a great game plan and stuck to it almost exclusively throughout the match. Becky was definitely he aggressor here, and it was interesting seeing Charlotte playing defense for the majority of this fight. Both women did a great job of making this feel like a personal fight while still utilizing their technical skills. Very entertaining. A trailer for The Marine 6 starring The Miz, Shawn Michaels, and Becky Lynch. A promo for Connor’s Cure. New Day celebrates their title defense earlier tonight. Mr/ Bootyworth brings them some champagne, but Kofi is missing. Kramer Kingsman shows up and asks New Day “what’s next.” The Bar is next. Great match! This match kept building and building to a frenetic finish. There were multiple sequences late in the match that kept getting better and better. It was getting more and more difficult to see when and where the match was going to end as it went along. Everyone was great in this, and the team of Ziggler and McIntyre looked especially good. They were probably the dominant team for the majority of the match. Though, the last few minutes were completely up for grabs. I loved the finish to this. A commercial for the Mixed Match Challenge featuring the teams of Naomi and Jimmy Uso versus AJ Styles and Charlotte Flair, as well as Kevin Owens teaming with Natalya and Braun Strowman teaming with Alexa Bliss. A video package of Samoa Joe’s bedtime story. Great match! Styles and Joe built this match up more than probably any other match tonight so far. It was a gradual build, but they were constantly dishing out punishment to each other that accumulated more and more. After a certain point, Joe seemed to pull ahead of Styles. Styles looked like he was in trouble, but that’s when Styles started showing his heart and resilience. Styles hit as many big moves as were countered, and that made the match unpredictable. I really liked the finish as well. Tonight on the WWE Network: Mick Foley – 20 Years of Hell. Natalya gives Ronda Rousey a pep talk as she prepares for her title defense. Charly Caruso welcomes The Miz and Maryse. Miz says Daniel Bryan and Brie Bella should be thankful for the attention they’re getting. Clips of the feud between Daniel Bryan and Brie Bella and The Miz and Maryse. Good match. Like last month, this was ultimately frustrating, but everything up until the end was good. Maryse did everything she could to stay away from the action, so Miz had to to a lot of work. Most of that work consisted of getting beat up which was pretty fun to watch. But the finish came out of nowhere and didn’t make a ton of sense considering everything that led up to it. That made the match feel very unfulfilling. A look at the feud between Ronda Rousey and Alexa Bliss. Good match. This was better than I thought it might be. Going into this match I didn’t really believe Rousey’s ribs would be much of a factor. Alexa’s game plan and course of action really helped sell it for me though. I started to believe that Bliss could beat Rousey. Of course, Rousey is never far away from a victory, but her explosiveness on offense while still getting beat up is fun to watch. Another commercial for The Marine 6: Close Quarters. A promo for RAW tomorrow night featuring The Undertaker. Samoa Joe complains to referee Ryan Tran when Paige walks up. Paige attempts to calm Joe down. She says the referee’s decision is final, but Joe will get another title match at Super Show-Down. Joe thinks that’s ridiculous. He plans to make things very difficult for everyone until he gets Styles in the ring. As expected, this started quickly with both men slamming into each other. They hit some of the expected moves and used ring steps and a kendo stick. It was fine for a Reigns versus Strowman match. Foley wasn’t really utilized in any significant wany as referee, so while it was fun to see him, his role was kind of pointless. I also think Hardy and Orton utilized the cell better in their match earlier in the night. Then everything started to go bonkers. Ziggler and McIntyre came down and tried to get into the cell, so that prompted Rollins and Ambrose to come brawl with them. The fight went to the top of the cage where two men eventually fell as they were climbing back down. 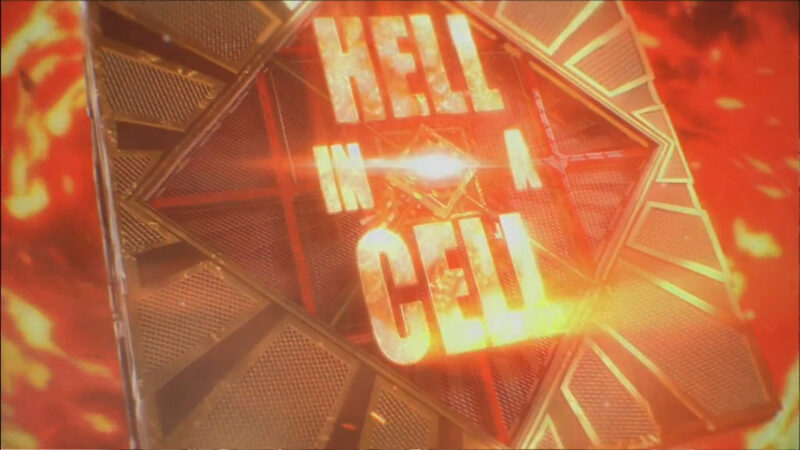 It was fun and tense, and it also distracted from the fact that Reigns and Strowman had pretty much exhausted their ideas for inside the cell. Then someone else showed up to cause even more destruction and shut everything down. This match was more about the spectacle than anything else. Nothing was decided and it felt like a pointless use of the Money in the Bank cash-in. I had some fun with the match, but it’s clear that with Reigns’ reign as champ, they are going to try to throw in everything (and everyone) they can think of to keep it interesting. I was pleasantly surprised by this show. For me, the main event was Styles versus Joe. I could have stopped watching there and been completely satisfied with the show (throw in a US Title match and a Cruiserweight Title match and it would be nearly perfect). The Universal Title, though fun at times, felt like more of the same from RAW. The Bryan/Miz stuff left me feeling unfulfilled again, and the RAW Women’s Title match was outdone by SmackDown’s women. Overall though, I liked the show quite a lot. I just liked the first half way more than the second half. This is a tough decision because the first four matches were all great for different reasons. If you ask me again later what my favorite match is, I might change my mind.